Toilet training your kids can be pretty daunting for a lot of parents, taking care of their kids hygiene as well as dealing with problems like clogged toilets can send you running away from the task of potty training. So if you are planning to take up the tedious task of toilet potty training, then www.wipeaide.com with its great product wipe aide and useful toilet training tips is your ultimate destination. Wipe aide is one the most important tool available for toilet training kids. It is a great product provided to you by www.wipeaide.com , which moistens your toilet paper so that it is easily dissolved when you flush it. The useful potty training tips and potty training video available to you on wipeaide.com will help you to deal with the task of toilet training more easily and will also allow you to show your kids graphically, as to how they are supposed maintain their basic hygiene using wipe aide. With wipe aide you have a environmentally friendly, plumbing safe alternative to, so called, “flushable” wipes and wet wipes. Potty training kids have never been as easy as it is with wipe aide. Apart from helping toddlers in toilet training , wipe aide also helps in keeping the whole family cleaner and fresher after using the bathroom. This great product featured on www.wipeaide.com only uses biodegradable toilet paper so the problem of clogged toilet is a thing of past. Now you can tell your kids to flush down their toilet papers, without the fear of any plumbing problems and clogging. Visit www.wipeaide.com now and avoid wasting hundreds and hundreds of dollars on bidet. 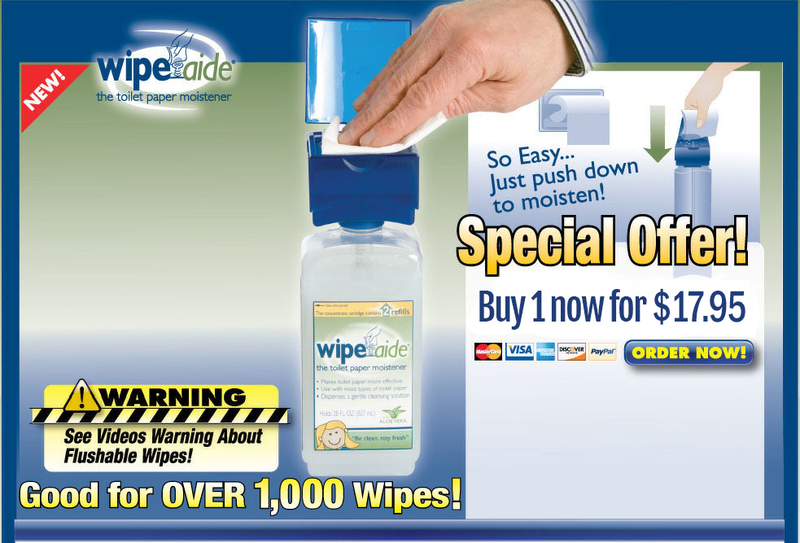 Wipe aide will act as your Bidet in a Bottle only it will be less costly and completely hassle free. With wipe aide all your problems and apprehensions about toilet training kids and maintaining hygiene will be a thing of the past. So what are you waiting for, visit www.wipeaide.com now and order your bottle of wipe aide today.